"Mudslinger" was my "handle" when I used to talk a lot on Citizen's Band radio. I am a professional "mudslinger"... I lay brick and stone for a living. "Mud" is mortar. "Mudslinger's Musings" is a window into what goes on in my mind while I'm laying brick and stone. Major threats facing all of us as Americans! They are everywhere, carried without proper vetting, and often concealed. Think before you point fingers. A serious menace to public safety, when used improperly! Yesterday, I watched the SUV ahead of me on the highway go completely into the oncoming traffic lane and run a driver off the road. Yep... another brain-dead cell phone user, texting while driving. God in a Nutshell: the CHOICE Trey smith: One of the first videos made by Trey Smith / God in a Nutshell project We think you'll enjoy it! God in a Nutshell (part III of III) The Illusion of Reality and the Holographic Universe. http://youtu.be/TVbJHaK7Tvc God in a Nutshell (part III of III) LONG http://youtu.be/S-SzIJngWqE God in a Nutshell (part II of III) http://youtu.be/ybn72lGO4O4 God in a Nutshell (part I of III) http://youtu.be/k--bg7t6iE4 http://www.godinanutshell.com http://www.readthieves.com http://www.treysnutshell.com http://www.readthieves.com Trey Smith | The Choice Understand God, Who is God, Who is mankind, Where is God, Truth of God, Answers God, Is God real, Nutshell......... . This guy is The Bomb! Click this link to see a graphic depiction of the deline of the US economy. 23 million Americans are now unemployed, in contradistinction to the lies of the Bureau of Labor Statistics. This chart shows only the beginning of the train wreck (click the link). 38 years experience as a brick and stone mason (self-employed) specializing in masonry restoration and historic preservation. The nearest one has a fireplace, and the one in the center of the house has a woodstove nook and a flu for the central heating system. Cozy nook in a colonial timberframe home. Water garden adjacent to a pool and stone retaining walls. Stone steps and retaining walls adjacent to a water garden in Scotia, N.Y. Restored gravesite of a 19th Century textile mill owner in Hudson N.Y. I built this one in the center of an old barn converted to living space. This new porch replaced old, disintegrated masonry. This is a chimney I built for a modular home. I built this one on a lakefront log home. 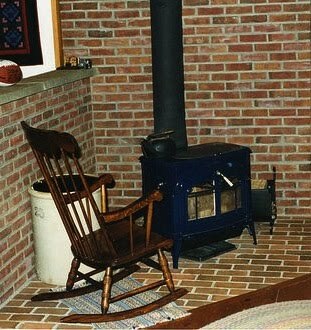 Here is an Adirondack cobblestone chimney I built in a new log home.